Man chains himself to Athlone bridge in one-man protest over cuts at Roscommon Hospital. A SINGLE PROTESTER disrupted rail services in the midlands this morning by chaining himself to the White Rail bridge in Athlone. According to Midlands 103 radio, the man was protesting over proposed cuts to the A&E department at Roscommon Hospital. He was removed from the site after the arrival of a Garda negotiating team. The Roscommon Hospital Action Committee has distanced itself from the incident, stating it did not sanction any protest this morning. Speaking to TheJournal.ie, chairperson of the committee John McDermott said the group were not aware of the protest and did not agree with any actions that would put a life in danger. He said he was aware that the delays to the rail service this morning affected some patients travelling for treatment and he could not condone the action. “It is the total opposite of our whole ethos,” he said. The action committee is carrying out a protest at Leinster House in Dublin tomorrow and will stage a demonstration on several bridges cross the Shannon on Friday. However, McDermott was clear that the protest will be on the footpaths and no roads or railways will be blocked. There is a huge amount of anger about the cutting of A&E services at Roscommon Hospital but we have not authorised any ‘block the bridges’ campaign. 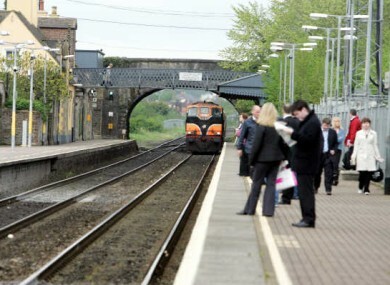 Those travelling on trains between Athlone and Ballinsloe this morning were transferred onto buses to complete their journey. Email “Rogue protester disrupts trains by chaining himself to bridge”. Feedback on “Rogue protester disrupts trains by chaining himself to bridge”.